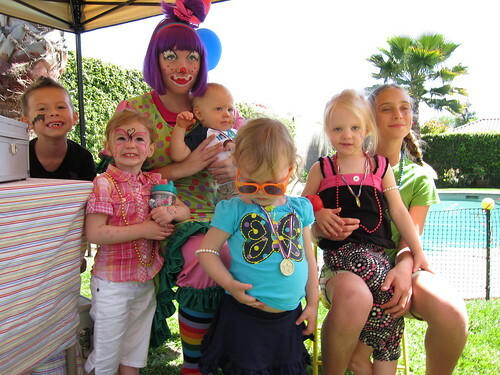 A bounce house, a clown and a lot of fun. Last weekend my Aunt KK and her daughter-in-law Tiffany worked till 3 in the morning putting together an amazing birthday party for Tiffany and Matthew’s son Evan’s first birthday. 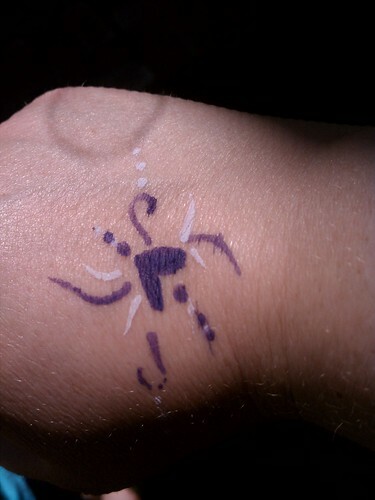 It was a circus party and they pulled out all the stops. The backyard was all set up with a bounce house and a game area, the dining room and kitchen were busting at the seems with goodies. 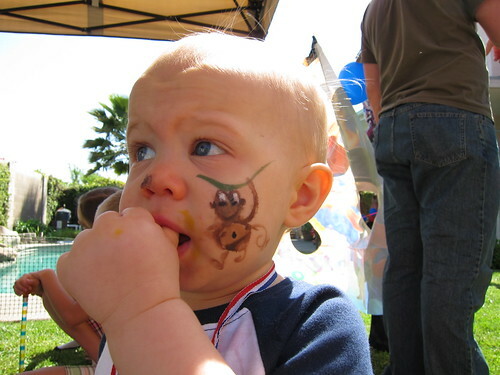 The party was filled with family and fun. Everything was perfect. When we first got to KK’s house my cousin Melissa’s 11 year old daughter took Lily out to the backyard to see everything. Let me stop here and point out how amazing it is that Lily went with Hannah without complaining, this never happens. 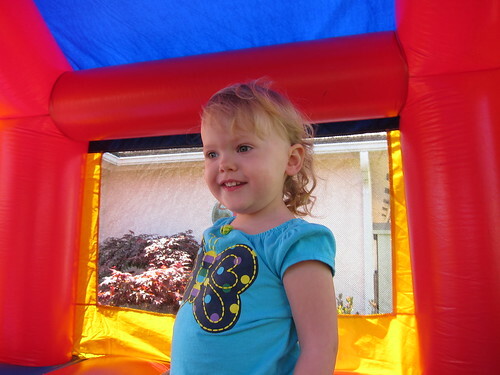 After probably 5 minutes I stepped out to check on Lil, she was in the bounce house looking very lost and a little sad. When she saw me she immediately wanted out and ME. We played on the swings till everyone was out of the bounce house and then we went back in. When it was just the two of us she LOVED it. 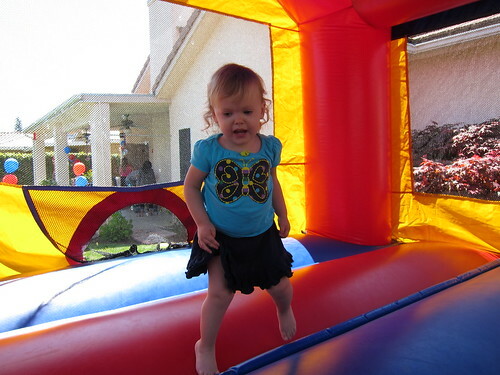 She’s been on a bouncing kick lately so this was magical to her. 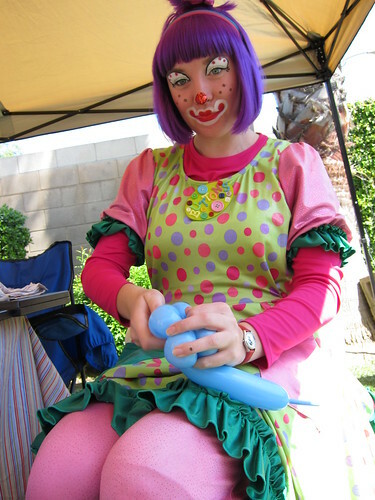 To keep with the circus theme my Aunt got a clown to come and entertain the kiddies. 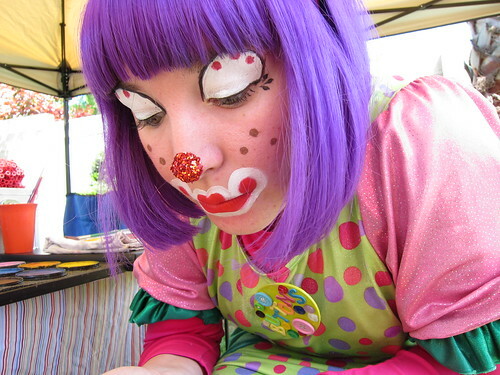 I have to admit I totally assumed that Lily would hate the clown and want nothing to do with her, but she didn’t, she was just her normal shy self. The makeup and crazy clothes didn’t bother her at all, this amazed me when you consider how much Santa scared her at first. Buttons the clown was a hoot. 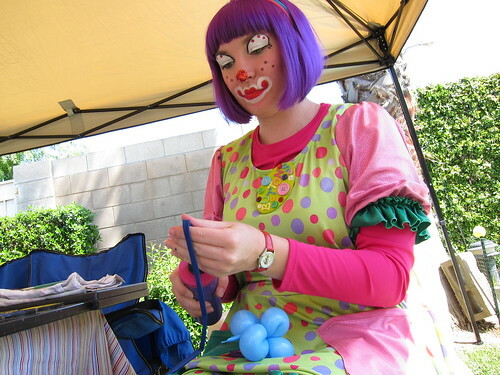 She made balloon animals, bracelets and hats. 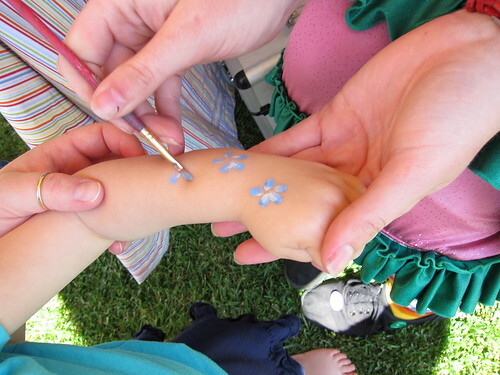 She did some face and arm painting and did a little magic show. The kids loved her and I loved how she interacted with the kids. 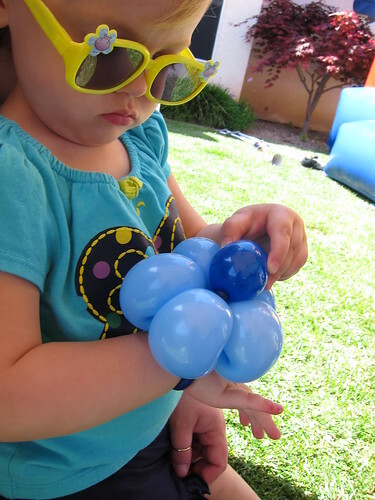 Lily got a flower bracelet. Apparently the bracelets are harder to pop. 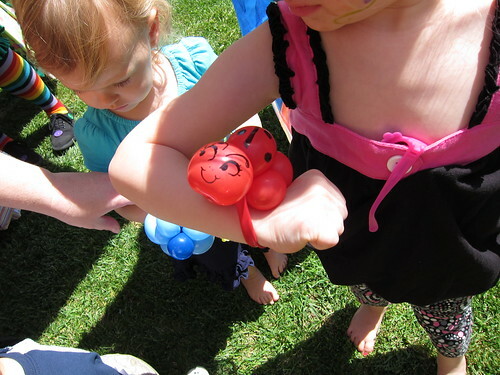 Tori (the birthday boy’s big sister) got a ladybug bracelet. 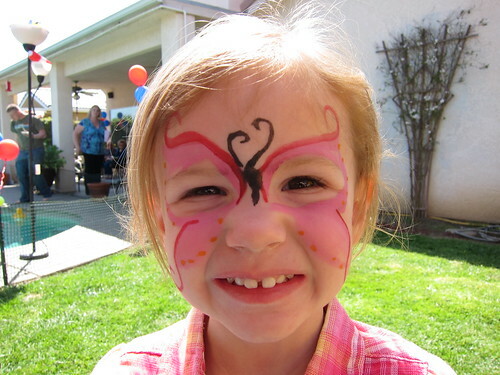 Tori got her face painted too. 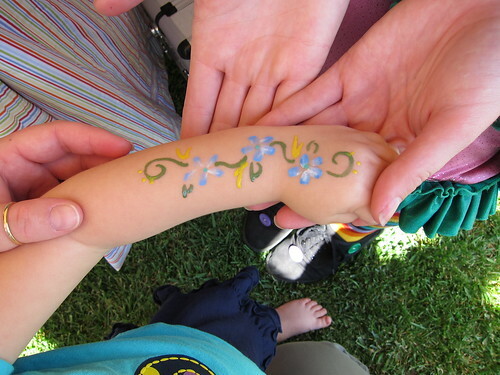 Lily didn’t seem interested in the painting at first, so I got a little heart painted on my arm first. 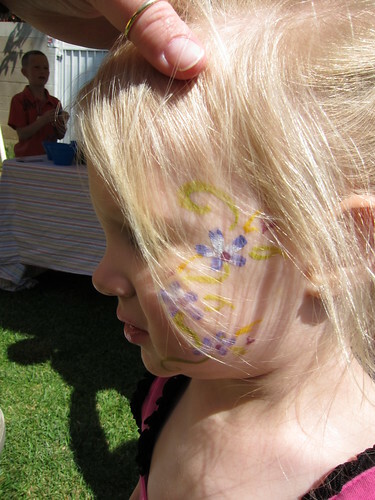 After she saw me doing it, she let Buttons paint on her. Olivia got a lot of painting done. She loved it. 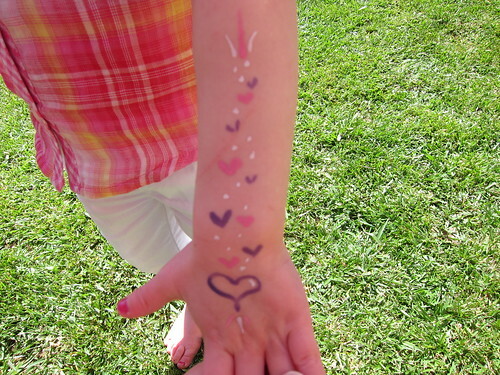 She got some little hearts on the other arm too, but I didn’t get pictures of it. 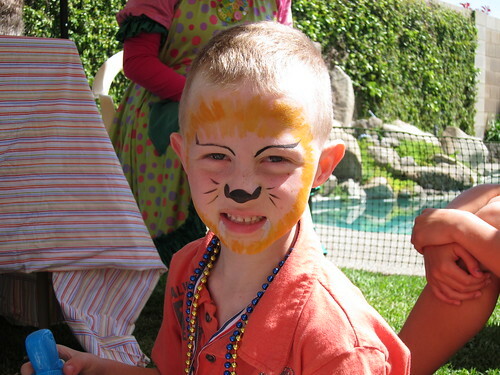 Logan (the birthday boy’s big brother) decided to be a lion. Every circus needs a lion, right. 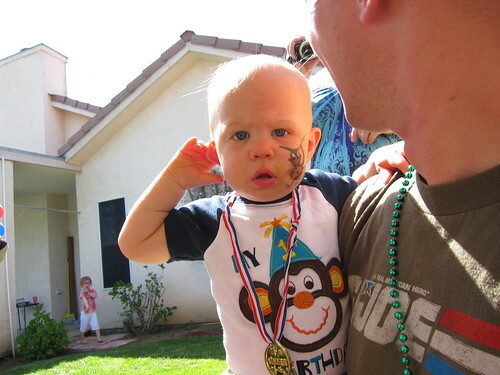 Evan, the birthday boy himself got a monkey on his cheek to match his shirt. 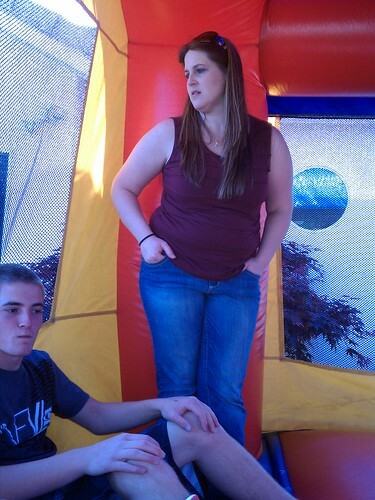 At the end of the party, when it was just a few of us left, we all got in the bounce house and relaxed. Or bounced. Or played. Whatever, it was fun. 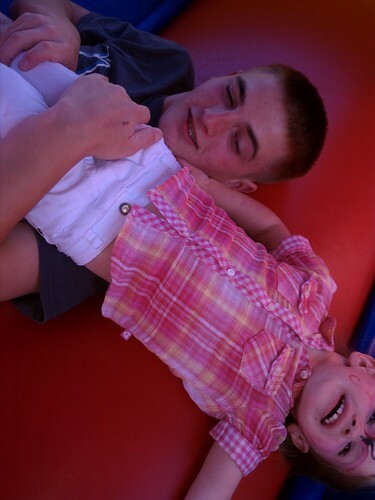 Max (Olivia’s big brother) and Olivia playing. 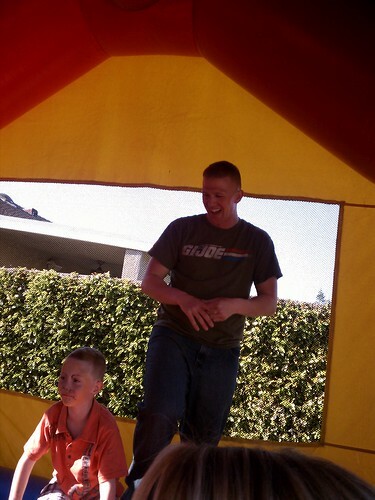 Matthew (my cousin and the birthday boy’s daddy) and Logan playing. 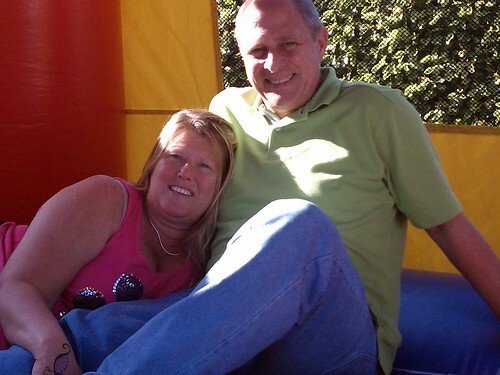 My aunt Kk and Uncle Dixon relaxing. Lily slept really well that night, she played herself silly. And now as a result of how much fun she had in the bounce house we have to avoid the park on weekends because she doesn’t understand or believe that strangers don’t want to share their bounce houses with her. This entry was posted in Friends and family, Fun, Life, Lily and tagged Friends and family, Fun, Lil.